Cortney began dancing on and off at the age of three. She has trained in tap and ballet at both Viki Lynn’s School of Dance and Dayton Dance Conservatory. In 2009, Cortney began hip hop at Dance Etcetera. She quickly realized her passion for it, and became a competitor and student teacher the next year. At 16, she began choreographing and teaching for Dance Etcetera’s junior and senior competitive hip hop teams. While at Dance Etcetera, Cortney was a member of the competitive dance team. In 2011, Cortney began dancing at Funk Lab with Labwerk Crew and training under Kelly. While at Funk Lab, she has been a part of Labwerk, Intensive, and College crews, performed at Urban Nights, Dayton’s Hip Hop Showcase, Dayton Women in Dance, Smagmare, Urban Nut-cracker, Monsters of Hip Hop, Yellow Cab, and others. She has had the opportunity to teach guest workshops at Down with DYT and at Cutting Edge Dance Studio. In 2012, Cortney began teaching for Funk Lab and quickly developed a huge passion for teach-ing, instructing, and leading young children and teens. In 2015, Cortney became trained in Autism Movement Therapy and was the teacher for the Sensory Swagg class where she mentored and fostered social growth of children with autism through dance. Also in 2015, Cortney was awarded the prestigious Alan Funk Award at Monster’s of Hip Hop in Washington D.C.
Cortney continues to be a leader with her outstanding and creative competition choreog-raphy. In 2016, Cortney was awarded 2 Top Teacher Awards at Star Systems. She was also the winner of the “13 and over Choreography Award” at Legacy Dance Champion-ships. Three of Cortney’s classes got golden ticket invites to The World Dance Champi-onships at Nexstar, and she was a key choreographer and teacher in Funk Lab’s routine “We Still In This” that won The World Dance Championships. During the 2017-18 dance season, Cortney won numerous Top Teacher awards at Star Systems and two choreography awards. Funk Lab’s production “Street Life” also won a Golden Ticket Invite to the World Dance Championships under her instruction. 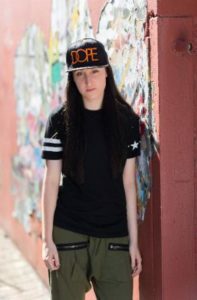 Always pushing herself to continue to grow as a dancer and choreographer, Cortney continues to train regularly at Funk Lab, Monsters of Hip Hop, and Broadway Dance Center in NYC.